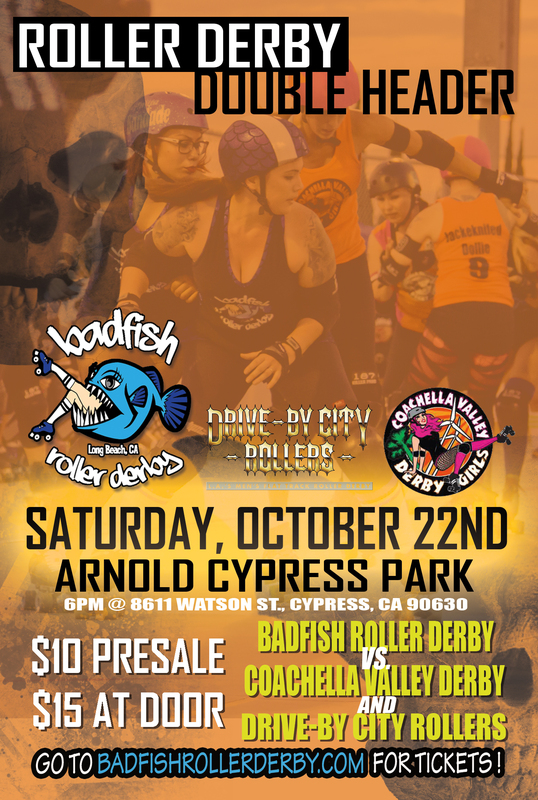 Badfish Roller Derby October Double Header! Mark your calendars for October 22nd! This will be a fun-filled night packed with plenty of hard-hitting roller derby action! In Orange County, California, just miles away from Long Beach, Badfish Roller Derby will be hosting Coachella Valley Derby Girls as the sun begins to set. To make this a double-header, the Drive-By Coed Black & White bout will feature men AND woman battling for the win with a few Badfish all stars. You don’t want to miss this one. The action starts at 6pm with Badfish vs. Coachella and the Drive By Coed Black & White bout will start shortly after. Tickets are $10 presale at Brown Paper Tickets or $15 at the door! Get your tickets ASAP. Event address and more details can be found below.